When choosing flooring for your house, people always look for how can the choosen tiles affect the aesthetic look of the house. Nowadays, tiles flooring is one of the most popular flooring options due to its sleek appearance. Apart from the all good things, tiles need proper installation and care during and after its installation. If you do not give proper attention during while tile installation, the various defects may appear on the tile surface i.e. buckled tiles or pop up tiles, cracking of tiles, faded tiles, etc. Among them, pop up or tenting or buckle tiles is one of the most common tiles defect that has been observed in the floor tiles. What is Buckled or Popped up or Tented Tiles? When your floor tiles lift from their originally installed position and start pushing other tiles against one another. Therefore, it creates a ‘tent-like’ bump in your floor. This tile defect is known as buckled tiles. This defect is also known as pop up tiles or tile tenting. Buckled tiles defect may appear in all types of tiles, i.e. ceramic tiles, vitrified tiles, porcelain tiles, etc. if proper care not taken. The perfectly flat tiled floor may buckle up in the different season due to temperature variations, improper installation of tiles, etc. Improper cleaning of the floor before tile installation, the uniform bonding layer may not get It may result in tiles to get pop up. Tile is a permeable material hence after some time, it may get swell with high moisture absorption. Due to expansion, the pressure may cause the tiles to pop up and therefore the tiles may get tent, i.e. say buckled. Uneven subfloor is also one of the reasons for buckled tiles or pop up tiles. The uneven subfloor will not have uniform bonding with adhesive or mortar with tiles and the subfloor. This will lead to tile tenting. 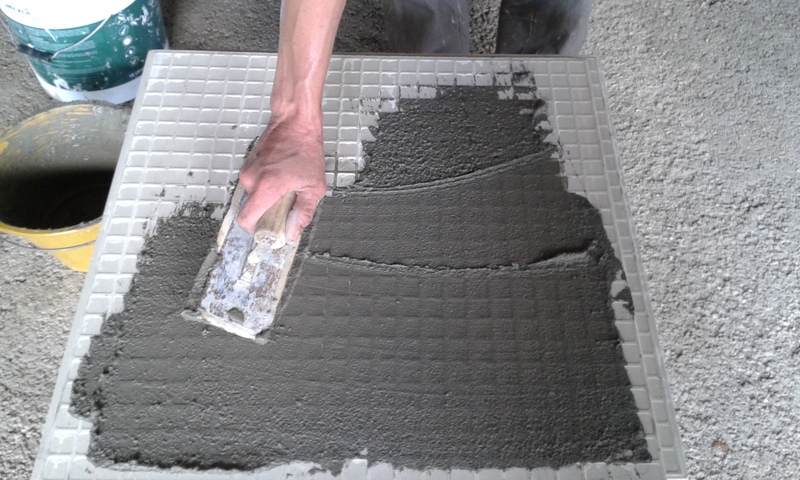 Large or oversized tiles require a certain troweling technique to ensure that they achieve a strong bond with the adhesive. All tiles need a gentle whack with a wooden object when being installed to set them in the adhesive. The tiles which have been installed without adhesives may also cause tile floor buckling. Read here: Expansion Joints in Tiles: Reasons & Consequences! When the tiles that are fixed with the bonding agent to the floor, the underlying substance will not form a secure bond. Due to slight changes in environmental conditions like a change in temperature or humidity, the bond will lose its grip and the defect of buckled tiles may appear. If the area of the floor is directly exposed to sunlight and if poor quality adhesives are used, then there are chances of tile tenting or popping up of tiles. The direct sunlight will be leading to expansion of tiles. Hence if adhesives are not strong, it may pop up and buckle. Use the proper bonding material. If a dry powder bonding agent is used, you should check whether it is properly mixed or not otherwise it may result in pop up of tiles. Using old tiles may also cause the tile floor buckling. Old tiles may get brittle. As with passage of time, they lose flexibility and are not able to withstand changes due to temperature variation. The manufactured tiles are already bent. So, if you are using such tiles, there may be chances of tiles to pop up. Why Tile Tenting After a Number of Years? If the tile is poorly bonded, the tile can tent very quickly. If there is a strong bond, often the grout will compress before the tile will lose its bond. When tile fails with a loud sound, it indicates that a good bond was present. Frequently, either the tile or the concrete will be without thinset residue as if the thinset (mortar with adhesive) was not applied correctly. In short, every tile installation should allow for movement. Properly designed installations, where expansion and contraction do not create shear forces, should have no problem for the tile to stay well adhered. The above is a list of a few contributing factors which leads to defect of buckled tiles or pop up tiles or tented tiles. Therefore, you have to consider the workmanship behind the installation, the type of materials you are using, the surface on which you are going to install the tiles, skilled labour, etc. If all considerations had been taken into account, there should be no reason why the tiles would buckle or pop up. Ultimately, properly laid tiles give beautiful look to your home and also gives safety to the occupants of the house. Previous PostPrevious What is Plain Cement Concrete (PCC) in Construction of Foundation?